The Wampanoag was the lead ship of a group of large, very fast steam cruisers begun during the Civil War to deter foreign intervention in that conflict. When completed after the War, some of these ships proved to be the fastest steamships of their day. 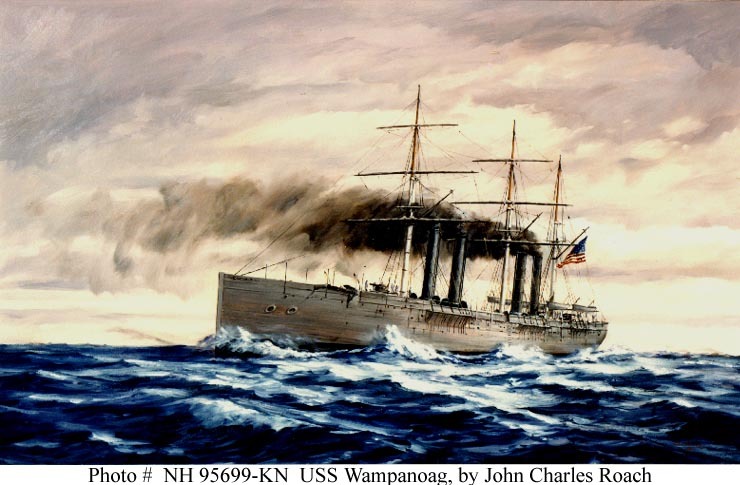 The steam-driven USS 'Wampanoag' was the fastest warship in the world, capable of 17 knots. Unfortunately, its indifferent performance in sea trials, plus its enormous extra costs, led US planners to recommend a return to sail. They were unsuited for peacetime conditions and were either converted to other uses or remained inactive until disposed of during the 1870s and 1880s. Commerce raiding by CSS Alabama and CSS Florida, both built in English yards, reached a point in 1863 where continued peaceful relations between the United States and Great Britain were seriously jeopardized. As a result, Congress responded by authorizing construction of a new class of screw frigates as part of the naval procurement bill of that year. These vessels, designed to be the fastest in the world, were intended for use in hit-and-run operations against British ports and commerce in the event of war. In the latter half of the war, the Navy Depatrtment undertook the construction of several classes of vessels of considerable size, but very different in character. These were large, wooden steamers, with fine lines, excessively long and sharp and narrow, of light draft for their size, in which every quality was sacrificed to speed. In some of these the length was as great as eight times the beam. They were to be sea-going cruisers. Their main purpose was to capture the commerce-destroyers; and perhaps, in case of foreign complications, to do a little commerce-destroying themselves. Their armament was heavy; but armament was not their principal feature. Above all things, they were to be fast; and in those that were built, the desired result was generally secured. One of them, the Wampanoag or Florida, succeeded in attaining for a short time the extraordinary speed of seventeen and three-fourths knots an hour. The plan which comprehended the construction of these vessels was a scheme of somewhat large dimensions, and was never completed. Of the three principal types, named respectively after the Ammonoosuc, the Java, and the Contoocook, twenty-five vessels were projected, and most of them were begun; but few of them were launched, and these only after the close of the war. Tremendous debate caused by the design delayed construction, preventing most of them from being completed in time to serve in the Civil War. Wampanoag, with a displacement of 4,215 tons, contained numerous design features unprecedented in American naval construction. Her hull -designed by clipper ship architect B. F. Delano- was unusually long and tapered relative to the vessel's beam. Her machinery, developed by controversial Naval Engineer B. P. Isherwood, was unique for its geared steam engine in which slow-moving machinery coupled to fast-moving propulsion gear. For her time an extraordinary amount of hull space devoted to machinery in this high-performance ship. Eight coal-burning fire-tube boilers, four of them with superheaters, are arranged in two boiler rooms; between them are two compound reciprocating engines which turn Wampanoag's four-bladed 19-foot propeller. The steam frigate Madawaska, one of six fast cruisers laid down in 1863 at Boston Navy Yard, was launched 8 July 1865. Madawaska, a screw frigate built of wood at the Brooklyn Navy Yard, was launched 8 July 1865. She was renamed Tennessee 15 May 1869 and timbered up to the necessary height to allow a spar deck to be installed. She was fitted with new compound back-acting engines capable of developing 3,200 horsepower. She carried 380 tons of coal but she was also rigged for sail, the area of her 10 principal sails being 22,500 square feet. Her spaciousness and the comfort of her quarters as well as her handling characteristics made her a favorite duty station. In "The Steam Navy of the United States" Frank M. Bennet relates that during the time Tennessee was flagship of the North Atlantic Squadron she was "the largest vessel then in commission in the American Navy, and the era of mastless -steel cruisers was yet so far away that she was not suspected, by the youngsters at least, of being obsolete and stood as the type of all that was excellent and majestic in ship construction." Tennessee was sold 15 September 1886 to Burdett Pond of Meriden, Conn.
Pompanoosuc, a screw steamer whose building began about 1863, was renamed Connecticut on 15 May 1869, but was never launched; she was condemned and broken up in 1884. 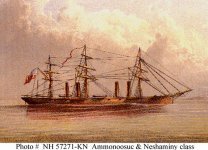 USS Neshaminy (1865-1874), a never-completed Civil War fast cruiser, was renamed Nevada in 1869. A colored lithograph (after a drawing by Captain Melancthon B. Woolsey, USN, published by the Major & Knapp Eng. Mfg. & Lith. Co., 71 Broadway, New York, circa the later 1860s) depicts the fast cruisers USS Ammonoosuc (1868-1883) and Neshaminy (1865-1874). The same print has also been used to depict the never-launched USS Connecticut, ex-Pompanoosuc. Ammonoosuc's hull was designed by Benjamin Franklin Delano to hold a pair of extremely powerful engines to be built at New York by the Morgan Iron Works according to plans drawn by Benjamin Franklin Isherwood for the screw frigate Wampanoag. These engines were not ready when Ammonoosuc was launched and the collapse of the Confederacy prompted a significant slowdown on the work as that all but eliminated the Navy's need for fast, new warships. 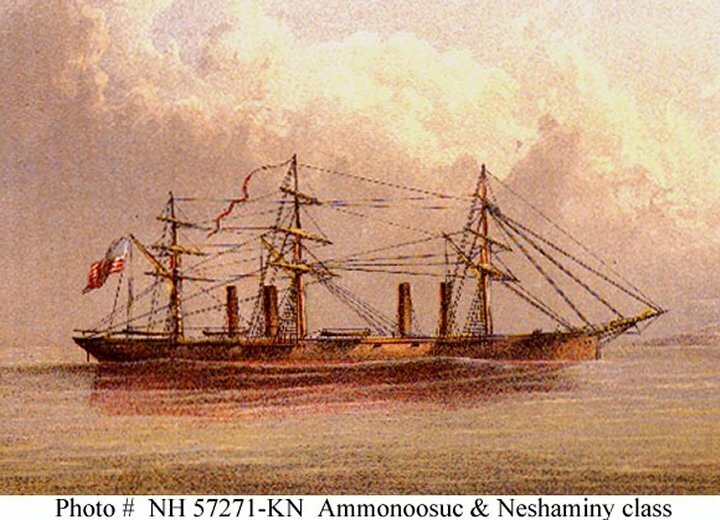 Ammonoosuc was laid down by the Boston Navy Yard sometime during the first half of 1863 and was launched, apparently without ceremony, on 21 July 1864. The engines were finally finished late in 1867, and Ammonoosuc's hull was towed to New York so that they might be installed. By late in the spring of 1868, the ship was finally ready to go to sea under her own power and-under the command of Comdr. William D. Whiting-departed New York on 15 June for a run to Boston at full speed. Dense fog over much of her course prevented her from proceeding at top velocity during most of the passage, but during one three-hour period she averaged 17.11 knots while moving from Cape Cod to Fort Warren, the highest sustained speed ever attained by a ship up to that time. Nevertheless, since an unusually large proportion of the space within her hull was taken up by her powerful engines and related machinery, the ship was not commissioned. Instead, she was laid up in the Boston Navy Yard. While there, Ammonoosuc was renamed Iowa on 15 May 1869. She was sold at Boston on 27 September 1883 to the firm of Hubel and Porter, of Syracuse, NY. Some sources maintain that there were five units in the Wampanoag class, while other report that the Ammonooosuc Class consisted of seven units. 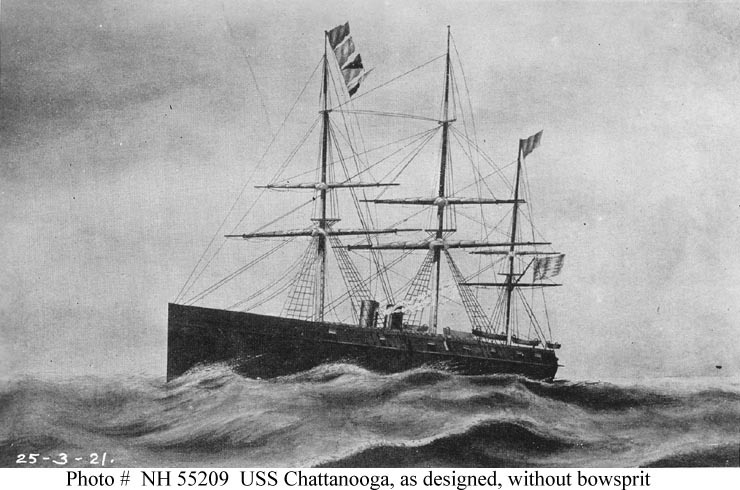 USS Chattanooga was launched 13 October 1864. USS Chattanooga, a 3043-ton steam sloop, was built at Philadelphia, Pennsylvania, the smallest of a group of large, very fast, steam cruisers begun during the Civil War. It is evident from the pair of stacks that she was equiped with some propulsion plant other than the Ishwerwood plant of Wampanoag and her sisters, which are distinguished by four stacks. Commissioned in May 1866, she ran trials in August of that year, making over thirteen knots, somewhat short of contract requirements. Chattanooga was laid up at Philadelphia after trials. In December 1871, her hull was damaged by ice and she was sold the following month. In 1864, Congress authorized the 3,700-ton AMMONOOSUC class screw frigate to take the renowned name BONHOMME RICHARD, but the vessel was never built and nothing is readily discoverable about her design. Isherwood was not alone in designing large, very fast, steam cruisers. In 1864 Edward Nicoll Dickerson (1824-1889) presented "The Navy of the United States : an exposure of its condition, and the causes of its failure" contained in a speech delivered to a jury in the Supreme Court of the District of Columbia, before Chief-Justice Carter, in the case of Mattingly vs. the Washington and Alexandria Steamboat Company." This was a criticism of the methods of B.F. Isherwood as Chief of the Bureau of Steam Engineering. Dickerson loved the sea and was a strong advocate of Naval power. Acting upon a theory of the chief engineer of the Navy that James Watt had made a serious error in maintaining that steam produced more power when worked expansively than otherwise, Secretary Gideon Welles had ordered engines of the no-expansion type for the new naval vessels. Dickerson promptly protested, in letter to the secretary and in communications to Congress which attracted wide attention, and, through his efforts were fruitless at the time, experience subsequently demonstrated the correctness of his views. His accomplishments as an engineer were less impressive. USS Idaho (1866-1874) USS Idaho, a 3241-ton steam sloop, was built at New York as part of a Civil War program of large, very fast, steam cruisers. Completed in May 1866, she ran her trials the following August, making just over eight knots. Her boilers and engines, ordered as a result of political influence, failed totally to achieve her fifteen-knot contract speed. Her twinscrew machinery was of a novel design by E. N. Dickerson and was built by Morgan Iron Works. This bizarre and unsuccessful steam powerplant was the creation of a politically influential attorney, whose earlier efforts at steam engineering had inspired the epic tale "Uncle Samuel's Whistle, and What It Costs", a classic piece of 1860s naval engineering humor. A board of Naval Offlcers recommended her rejection, but Dickerson appealed to Congress and obtained a resolution in February 1867 for her purchase by the Navy. 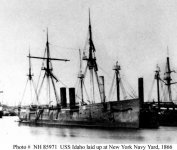 Briefly laid up after trials, Idaho was converted to a sailing storeship in 1867 and sent to Japan as a base for the US Navy ships operating in Asiatic waters. USS Algonquin, a 1173-ton Sassacus class "double-ender" steam gunboat, was built at Brooklyn, New York. Fitted with an engine designed by Edward N. Dickerson and built under his supervision, her completion was delayed by the slow construction of this machinery. Algonquin ran a series of dock trials in the fall of 1865. In February 1866 she took part in a closed-course "race" off New York against USS Winooski. The latter, with the same hull design as Algonquin, had a Navy-designed powerplant, and the contest was intended to demonstrate the value of Dickerson's machinery concepts. After twenty-nine hours of steaming, the race was called off with Algonquin's engine having shown its decisive inferiority on all counts. The ship was subsequently declared "unfit for naval service" and was not commissioned. Algonquin was sold in October 1869 and subsequently had a long career as a civilian vessel. Projected at the same time as the more ambitious Ammonooosuc and Idaho classes, the Guerriere class screw steamers were of conventional design and performance. 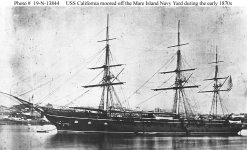 USS California, a 3954-ton Guerriere class screw steamer, was built at the Portsmouth Navy Yard, Kittery, Maine, as part of an extensive mid-Civil War program of large warship contruction. Originally launched as Minnetonka in July 1867, she was renamed in May 1869, well before entering commissioned service in December 1870. In March 1871 California began a voyage around South America to join the Pacific Squadron. Over the next two years, she operated in the eastern Pacific and also cruised to Hawaii. Built at a time when supplies of properly seasoned wood had been largely exhausted by earlier wartime construction, California's timbers rapidly deteriorated, a serious problem shared by most of her contemporaries. She was decommissioned in early July 1873 and sold in May 1875, just four and a half years after completion. The name Hassalo was assigned to a 3,365-ton gun-deck frigate in 1863. Listed in the Naval Register from 1864 to 1866, the screw steamer was never built. Her name was struck from the Naval Register in 1867. The data sheet in the Navy Department Library is chiefly blank. Although she was projected as a screw frigate and was first carried on Navy lists in 1864, Watauga was never laid down, and the contract for her construction was cancelled in 1866. 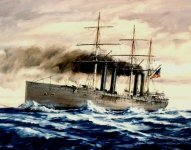 The 3,900 ton steam frigates of the 'Contoocook' class were the largest warships begun for the Navy in the years between the Civil War and the beginning of "New Navy" steel ship construction in 1883. Although ten units of this class were projected during the Civil War, only four were completed in the following decade. Projected at the same time as the more ambitious Ammonooosuc and Idaho classes, they were of conventional design and performance. They suffered from a well-known defect in design in which heavy seas regularly allowed water to menace the boilers via the hawse pipes. Her length was 253 feet, beam 48 feet and draught 20 feet 7 inches. They had reputedly a good turn of speed, one which surprised the British in the Red Sea one time as being between 14 and 16 knots, but which was officially 12.6. She was armed with 11 guns on her upper deck, 2 each side, 2 forward facing and 1 rearward on the poop. Their most powerful armament were the 8 large guns, 4 each side on the gun deck. 24 furnaces fed 8 boilers arranged 4 in line on each side in an engine room 94 feet long containing equipment which alone weighed nearly 800 tons. They were fitted with a very large underwater ram at the bow. The Navy did experiment with some new technology shortly after the Civil War. In 1868, a struggle to establish the primacy of steam power for its ships was unsuccessfully waged by Benjamin F. Isherwood, Engineer-in-Chief of the Navy from 1861 to 1869. In 1863, in competition with Chief Engineer Isherwood of the navy, engines were designed for twin ships, the "Wampanoag," afterward called the "Florida" and the "Madawaska," afterward known as the "Tennessee." Throughout his entire career the improvement of the steam-engine occupied a large share of John Ericsson's attention, and in particular was this the case in connection with his naval designs. From the "Princeton," in 1841, to the "Destroyer," in 1878, there succeeded one long series of types and forms of steam-engine, each in his opinion the best adapted to the circumstances of the case. Naturally, opinions differ, and he was brought into competition with other able engineers, and his designs were often called into question or subjected to criticism. Powered by two Ericsson vibrating lever engines, Madawaska departed New York City for sea trials 14 January 1867, Comdr. Francis A. Roe in command. Remaining at sea for 1 week, she steamed nearly a 1,000 miles before returning when her supply of coal was exhausted. This was a battle royal of types and modes of application of the power of the steam-engine to the propulsion of ships. The result was a victory for Isherwood, although Ericsson's "Madawaska," which was first subjected to trial, made a speed higher than any warship at that time afloat. This was exceeded by the "Wampanoag" a short time later; but neither engine was of an enduring type. The Tennessee became a source of postwar controversy, earning a reputation as a financial sinkhole. 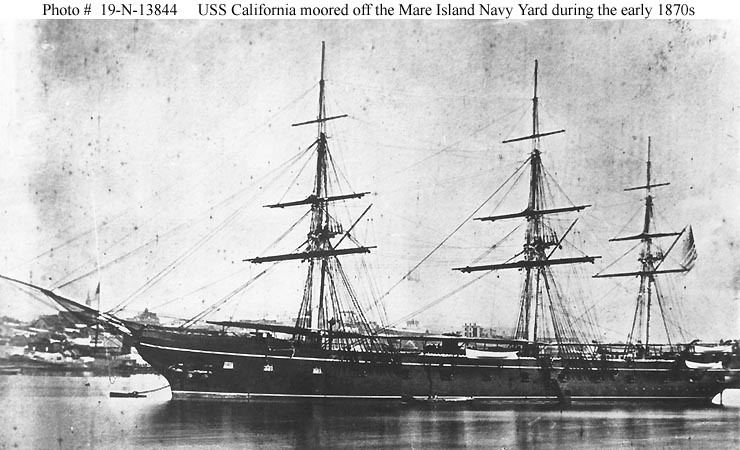 After laying up the ship in 1867, between 1869 and 1871 the Navy spent more than $500,000 for repairs and modifications. The vessel then embarked on a three-month voyage, and upon returning undertook additional repairs that required another three years to complete. The machinery of the "Madawaska" was removed, and she was repowered with a later type of machinery, and long did service as the "Tennessee" in the list of wooden frigates of the navy. For the USS Wampanoag, Isherwood had designed highly advanced propulsion machinery. The steam plant, one with improved heat and fuel efficiency, powered a main engine that drove the propeller shaft through a revolutionary reduction-gearing arrangement. Isherwood now took advantage of Wampanoag's sea trials to test -- and advertise -- the seagoing qualities of a large vessel whose outfit of sails was purely auxiliary to its machinery. The trials (a cruise from New York to Savannah, Georgia) took place from 7 February 1868 to the thirteenth. Bad weather caused a pause, but the final leg saw the Wampanoag averaging eleven knots for almost thirty-eight hours without mishap. At times it was able to achieve in excess of seventeen knots. The screw frigate finally left New York for sea trials on 7 February 1868. On 11 February, she commenced speed tests, running flat-out in rough weather from Barnegat Light, N.J., to Tybee Island, Ga. She covered the distance of 728 statute miles in 38 hours for an average sustained speed of 16.6 knots, at one point making 17.75 knots. Another naval vessel, American cruiser Charleston, did not equal this record for 21 years. From 22 February 1868 to 8 April, Wampanoag was deployed as flagship of the North Atlantic Fleet. 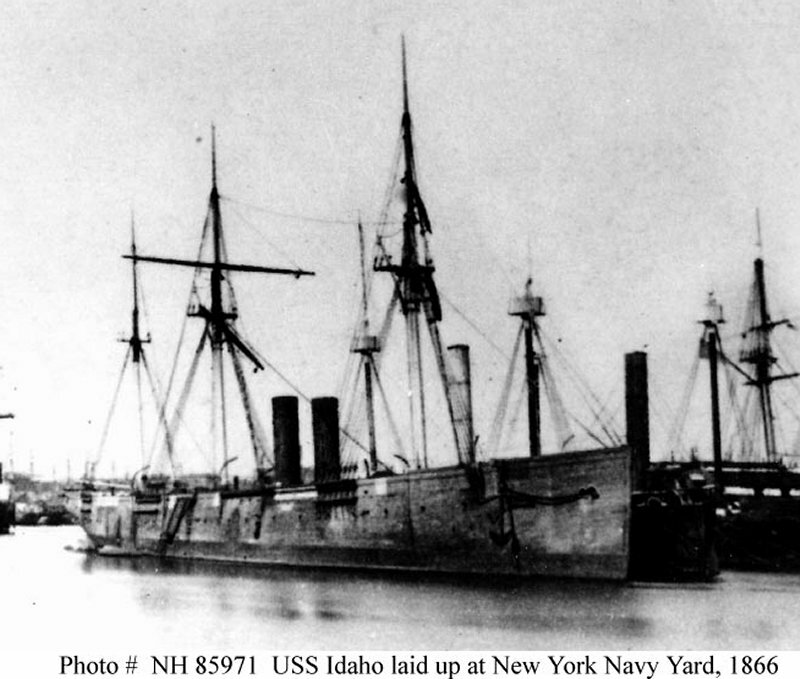 On 5 May 1868, she decommissioned at the New York Navy Yard. Wampanoag was renamed Florida on 15 May 1869. This remarkable ship (which in addition to its advanced propulsion machinery had a clipper-like hull designed by naval architect B.F. Delano) proved not only that a steam engine could propel a large craft at high speed through fairly rough waters but that modern propulsion plants could operate more efficiently than their predecessors and endure long journeys. 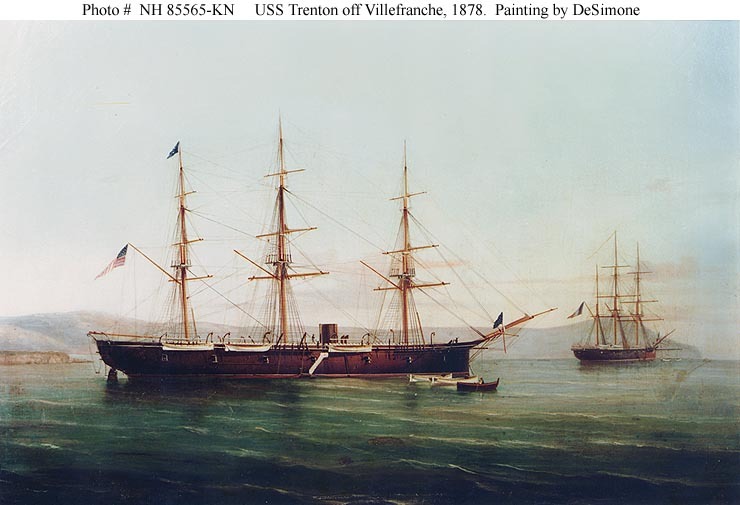 The Board of Engineers reported its evaluation to Gideon Welles, Secretary of the Navy: "The maximum performance can easily be maintained during a passage across the Atlantic, or for any required service, and we are of the opinion that it is not equaled for speed or economy by that of any sea-going screw vessel of either the merchant or naval service of any country." The controversy generated by the frigate's unconventional design reached a peak in 1869 when a naval commission [the Board on Steam Machinery Afloat] examined the vessel. The Board, established in 1869 primarily to evaluate Isherwood's project, deemed the innovative ship unsuitable for naval warfare. Rear Admiral R. M. Goldsborough, Commodore Charles S. Boggs, and Engineers E. D. Robie, John W. Moore, and Isaac Newton judged the ship unacceptable for active duty in the Navy. Its decision may have been biased by limitations peculiar to the Wampanoag, which had not been built to carry arms, bear armor plating, or house a normal crew. They complained of her unusually large machinery spaces, heavy coal consumption, and found particular fault with her narrow breadth relative to her length. The commission said this caused inordinate rolling and straining of the vessel. Further, the Department of the Navy held coal power in disfavor; it found the speed and maneuverability of a steamship to be offset by the need to refuel. Of course, sailing ships were at the whim of the wind, needed arcanely skilled crews, and could not carry infinite stocks of food and water; but unlike steamships they did not risk stopping dead in the water every time a (sharply limited) store of fuel was exhausted. As a result, Florida remained in ordinary at New York for five years before departing on 5 March 1874, bound for New London, Conn., to become a receiving and store ship at the naval station there. Florida remained at New London, rotting, until February 1885. 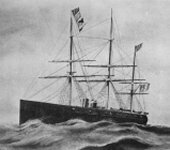 She was sold, at New York, on 27 February 1885 to Edwin LeBars. Under the pressure of urgent necessity, they had been built of unseasoned white-oak timber, instead of the live-oak which had been hitherto used for ships-of-war; and such of them as were finished were no sooner in the water than they began to decay. Six years after the war was ended, the chief constructor, writing of these vessels, reported that some of them, costing over a million of dollars, had made only one cruise, and then had been found too rotten to be repaired. They served the purpose, however of contributing, with other circumstances, to modify the menacinzg attituds of foreign powers; and their serious imperfections were the necessary result of the situation. According to one view, this was a case in which the US Navy had rejected an obviously superior technology. It was claimed that Wampanoag's problem was that she worked technically and failed socially. The Wampanoag represented not just a change in technology, but a change in the structure of military society. The board members were all sailors, at a time that this meant literally sail. Sailors stationed above decks would have nothing to do, their officers little responsibility or influence. On the other hand, sailors and officers involved with the machinery would ascend in power. The romance of sailing -- men climbing the rigging, hauling in the sheets, and so on -- would be lost. The debate over the merits of the Wampanoag continues, but its historical import is clear: while the ship introduced technology that would, years later, become a world standard, its official failure signaled the end of government-funded American experimentation with steam engines until the late 1870s. And yet this choice was not the obscurantist reflex it has often been represented to be. In the years just following the Civil War, to balance the contrasting attributes of speed and endurance in this way was a rational military calculation, particularly for a nation with worldwide trade but no overseas bases.